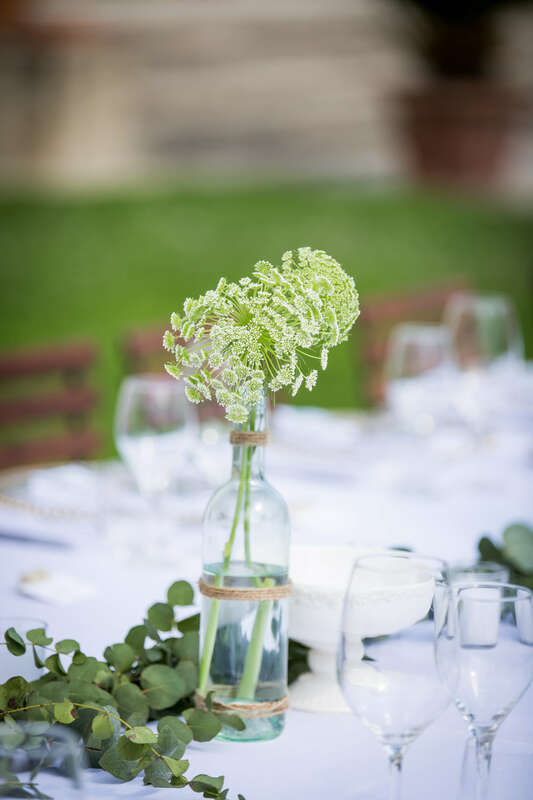 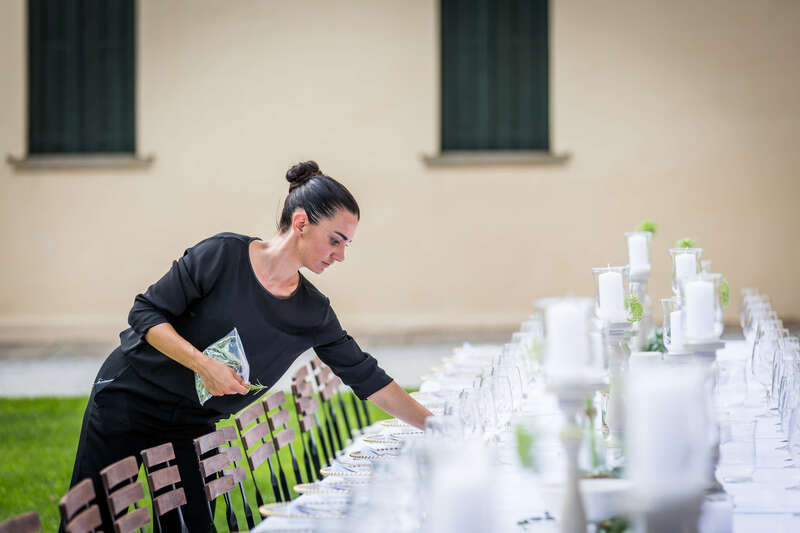 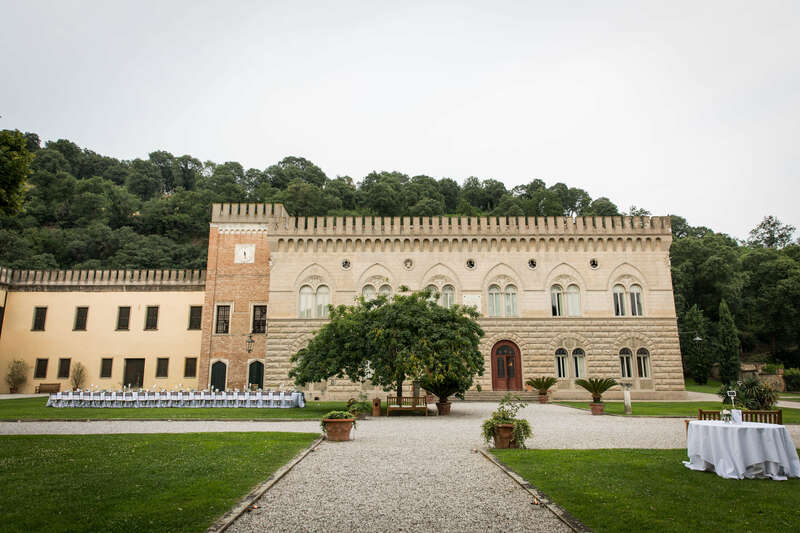 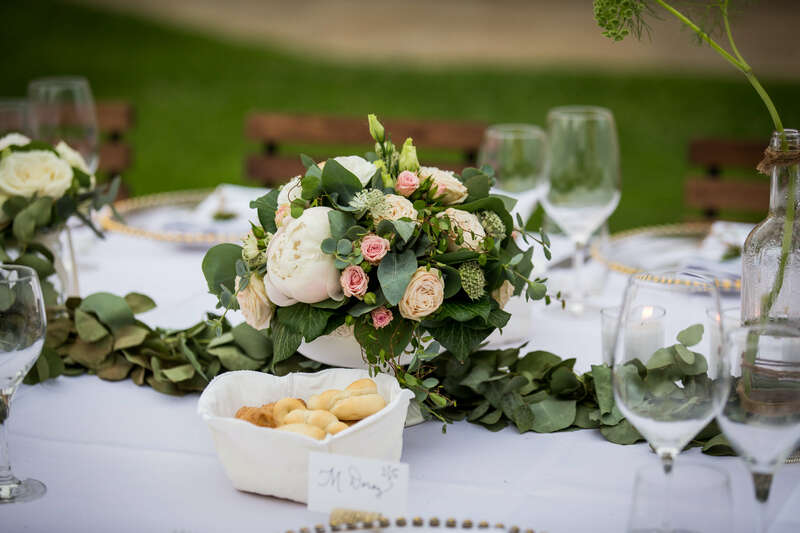 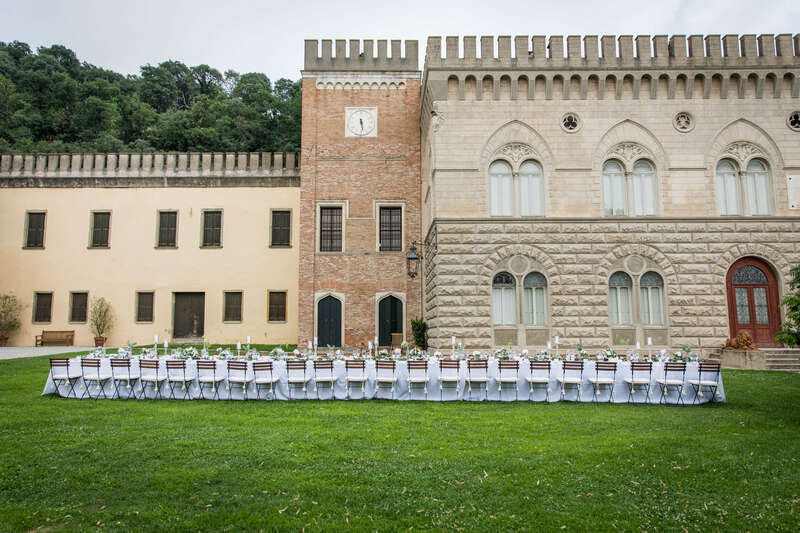 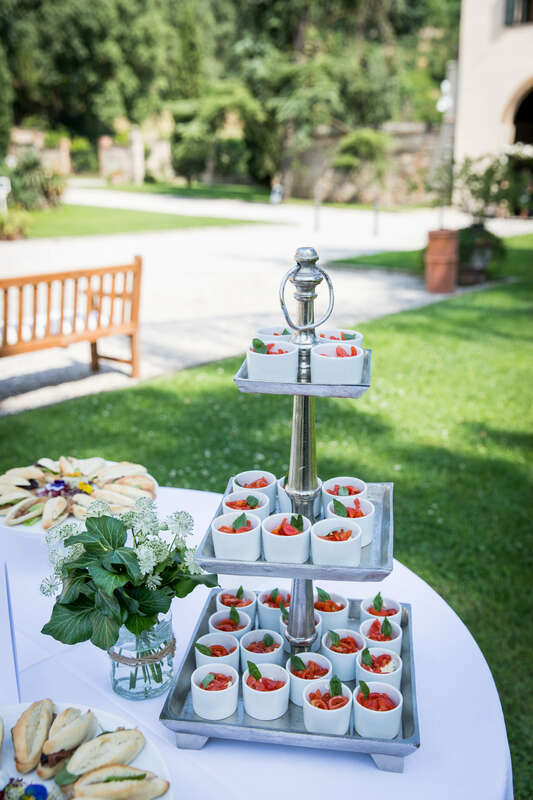 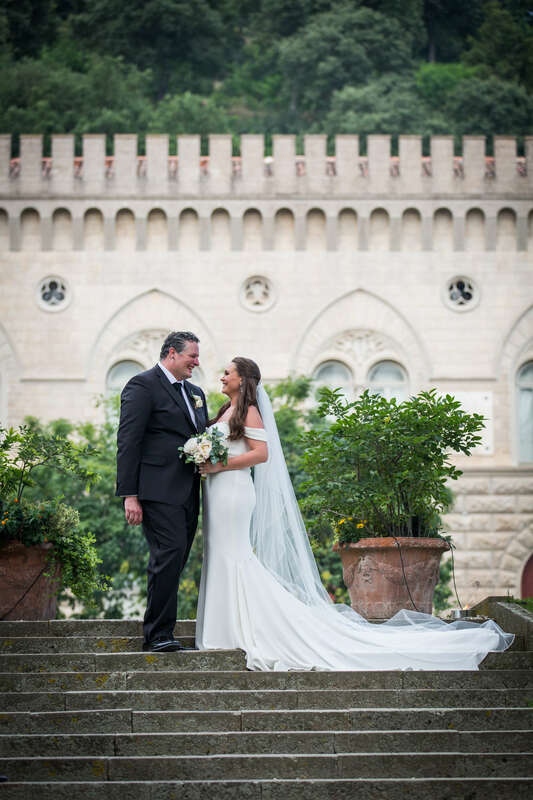 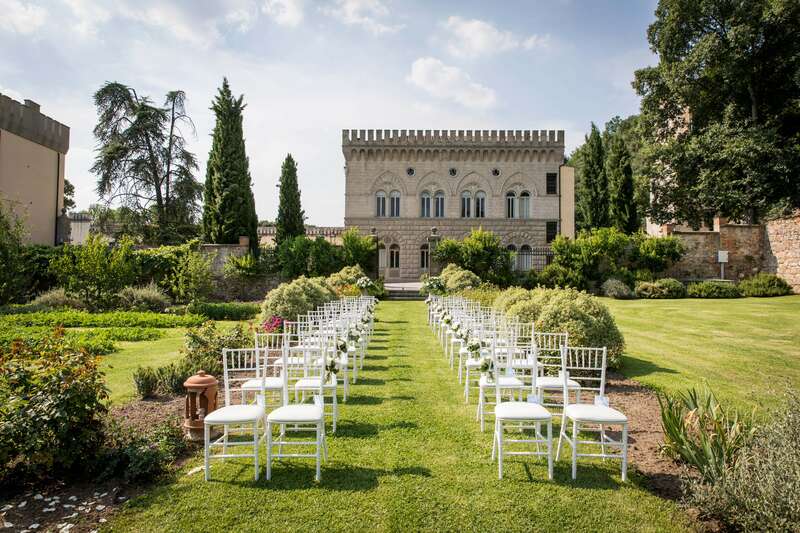 M & B had rented an ancient castle immersed in the green of the Euganean Hills and surrounded by vineyards for their intimate wedding in the Italian countryside. 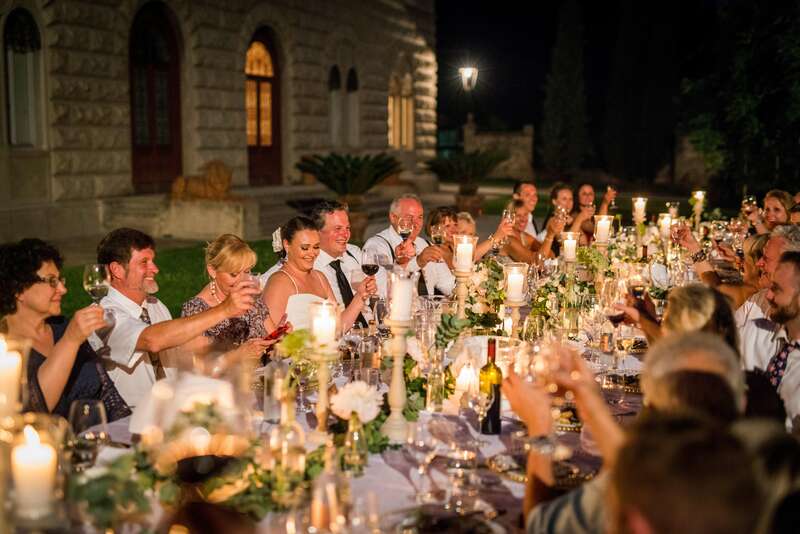 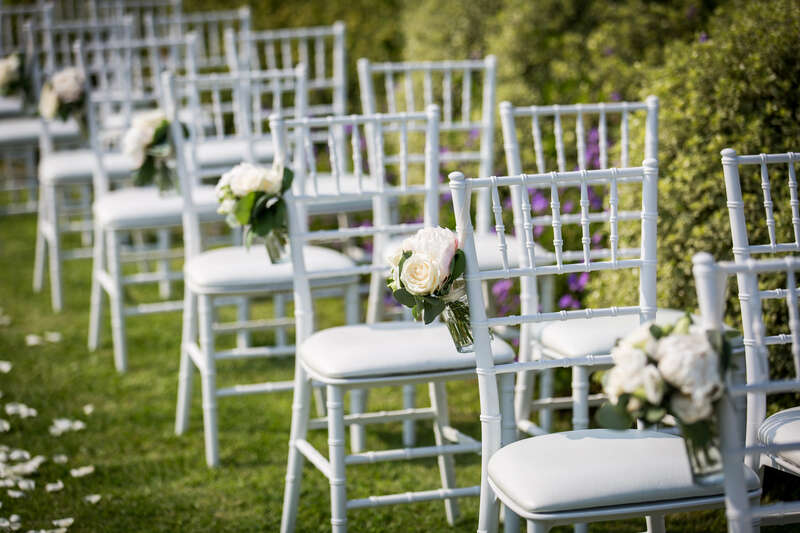 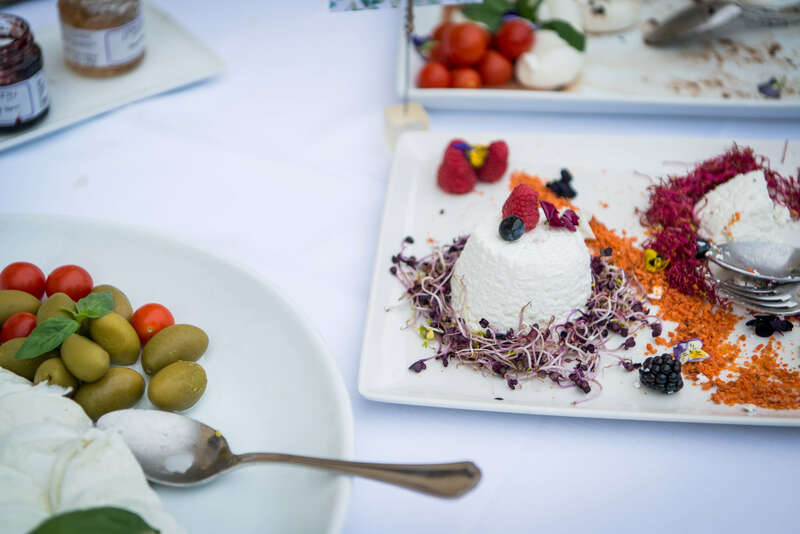 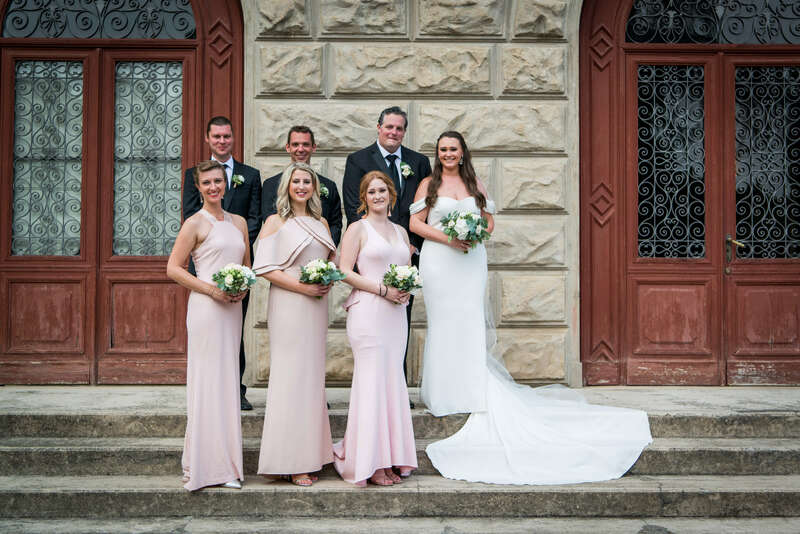 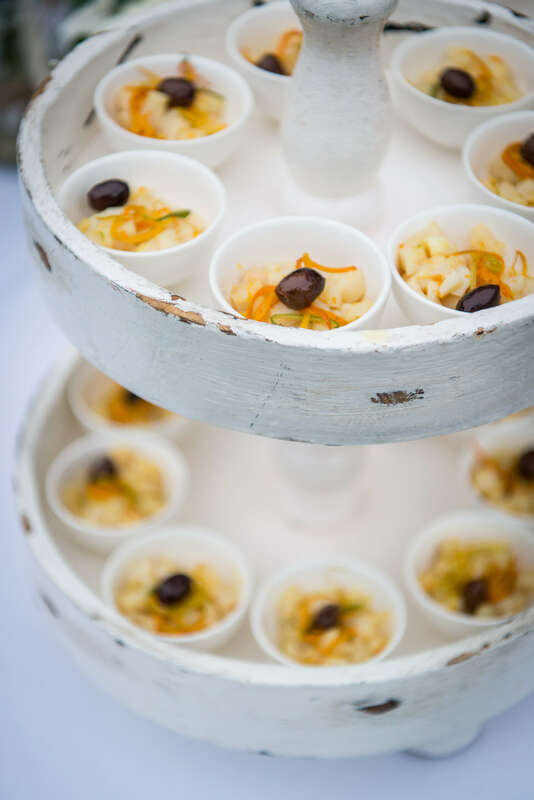 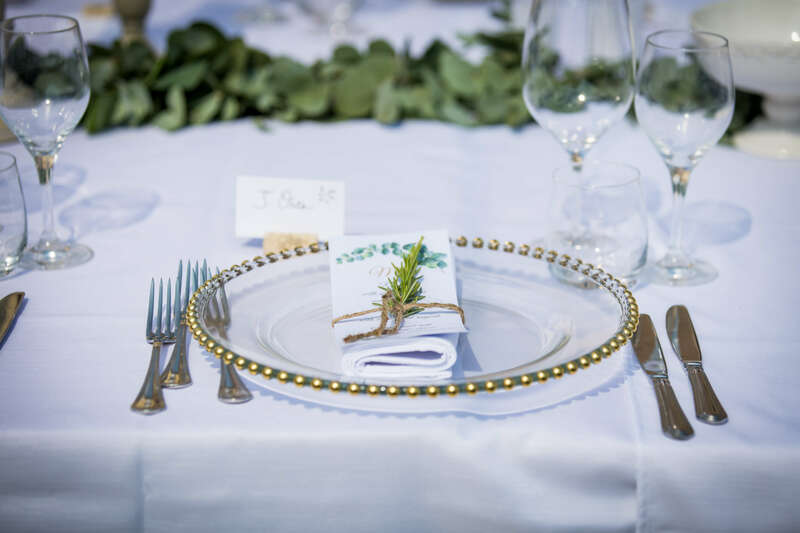 Their desire was to be able to celebrate in the company of their closest relatives and friends in an elegant, different, unforgettable, great food and lots of sun! 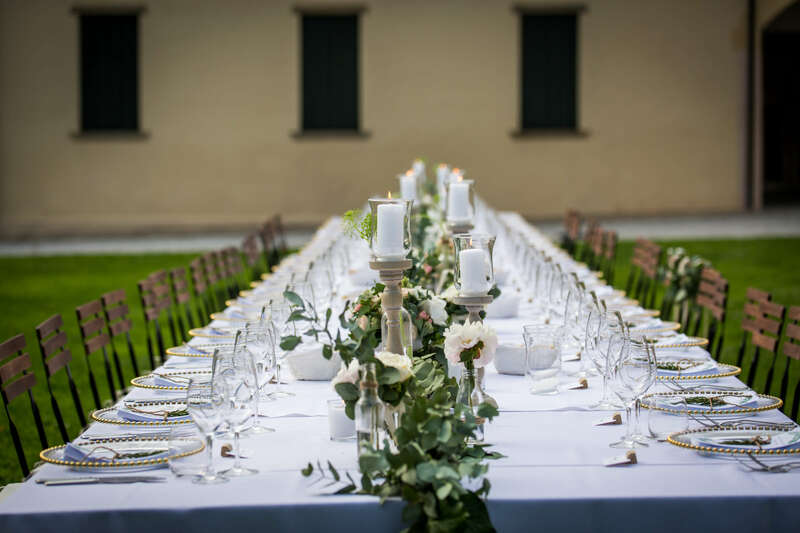 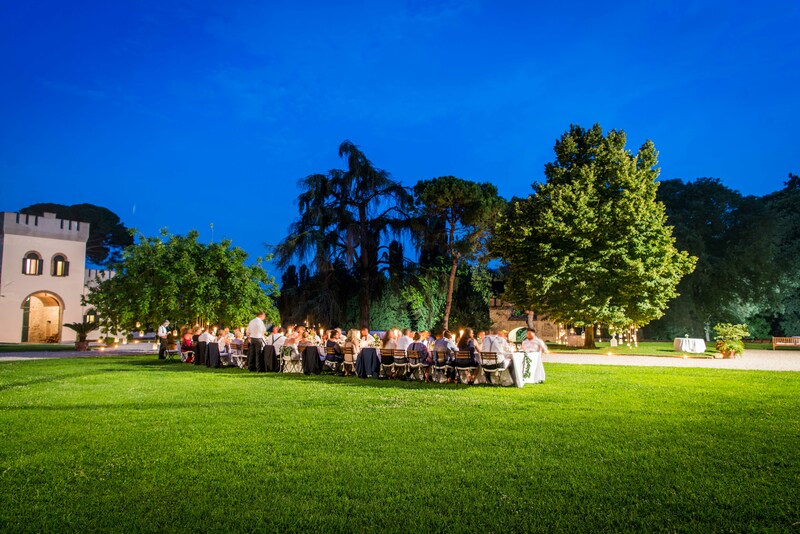 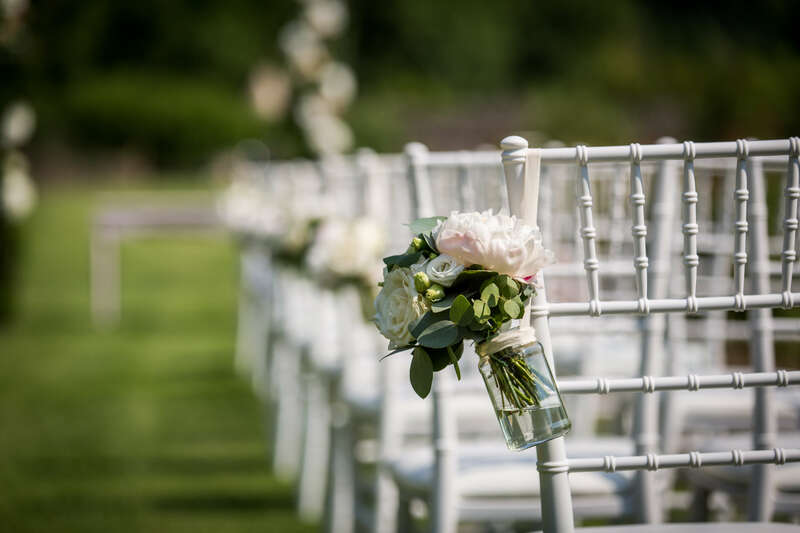 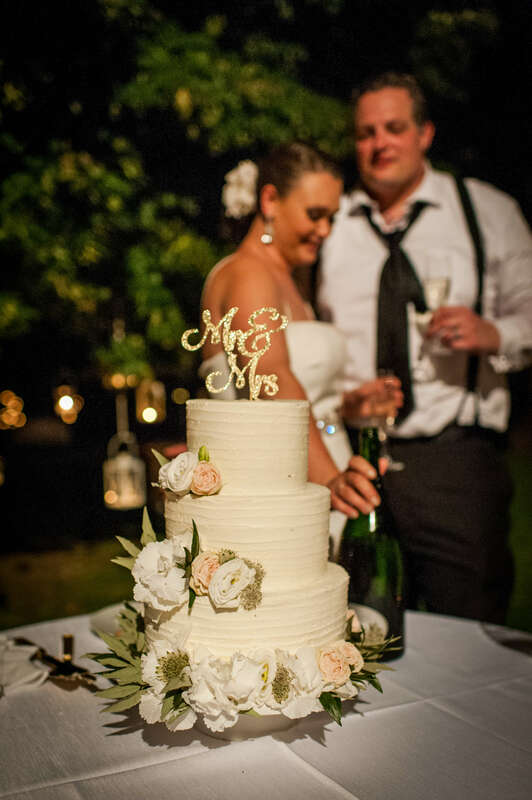 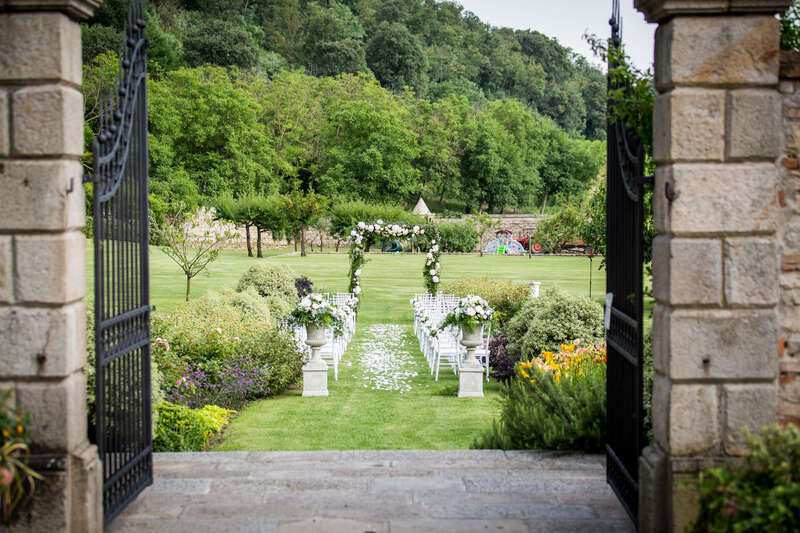 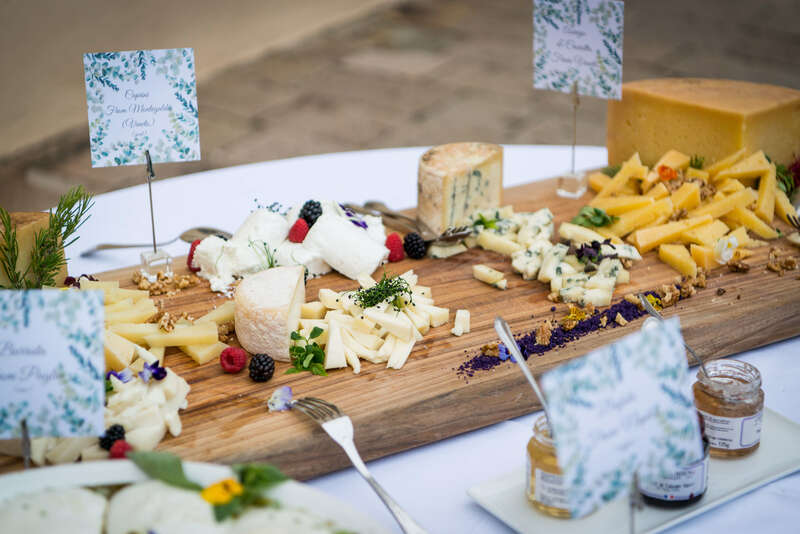 There are so many elements of this marriage that we loved a lot, starting with the ceremony on the grass, surrounded by spontaneous and fragrant flowers, the aperitif outdoors under the big tree and dinner under the stars in what is the day longer than the year, the summer solstice. 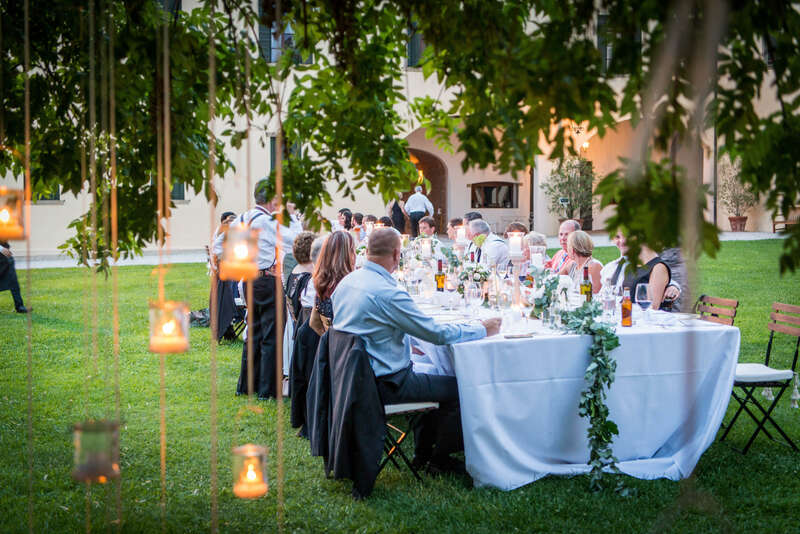 An atmosphere of other times, relaxed, fun, full of colors and flavors, rivers of wine and good music. 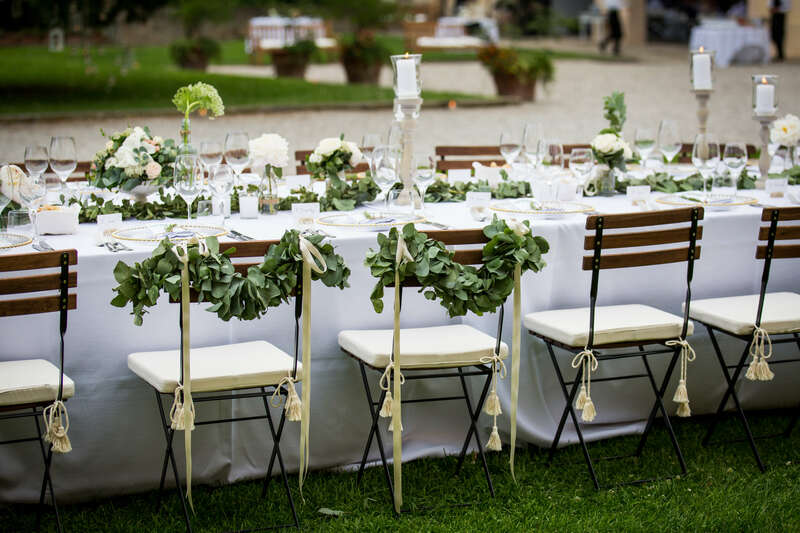 They could not think of a better way for the guests who are really held to celebrate their union. 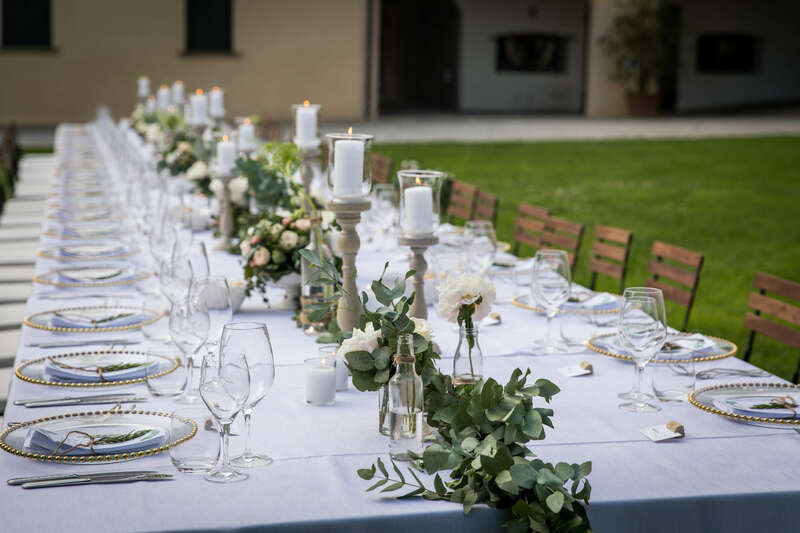 Every single moment and detail of this enchanting wedding has been taken care of with elegance, style and a lot of attention to every request. 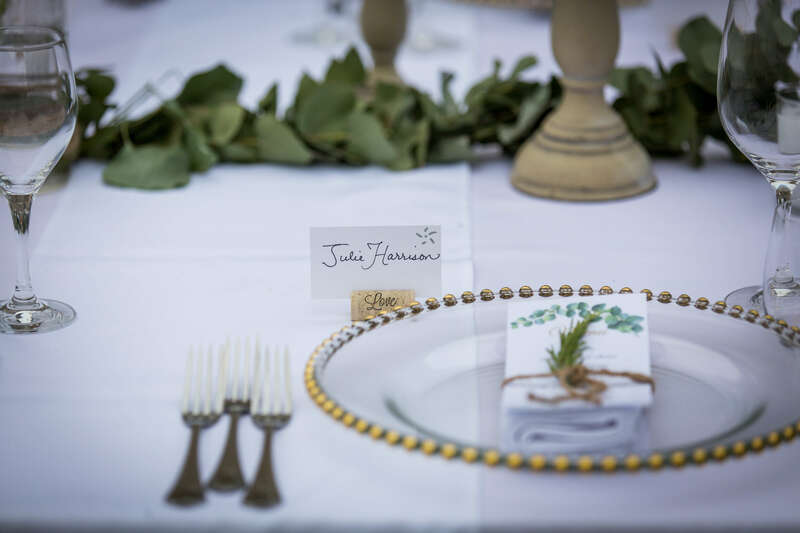 Planning and organization play a fundamental role and all the work is based on this. 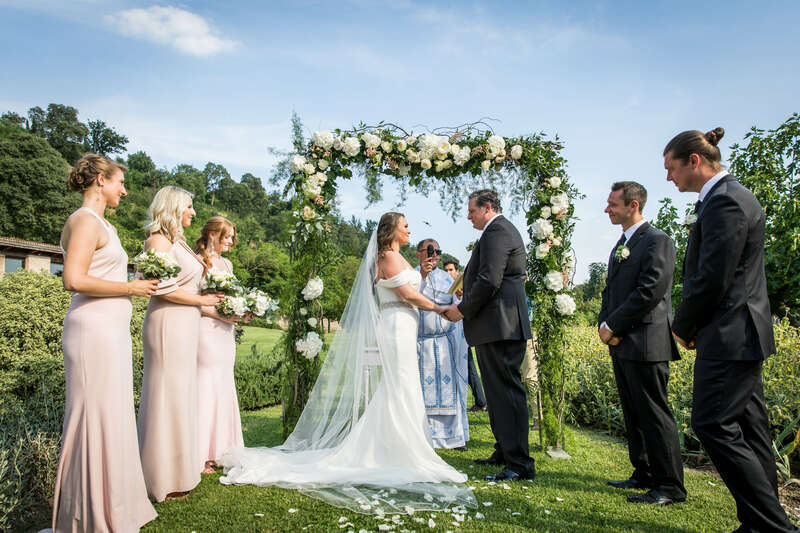 Marta wore a lovely wedding dress that emphasized her beauty and the bouquet in shades of white and green matched perfectly with all the wedding decorations. 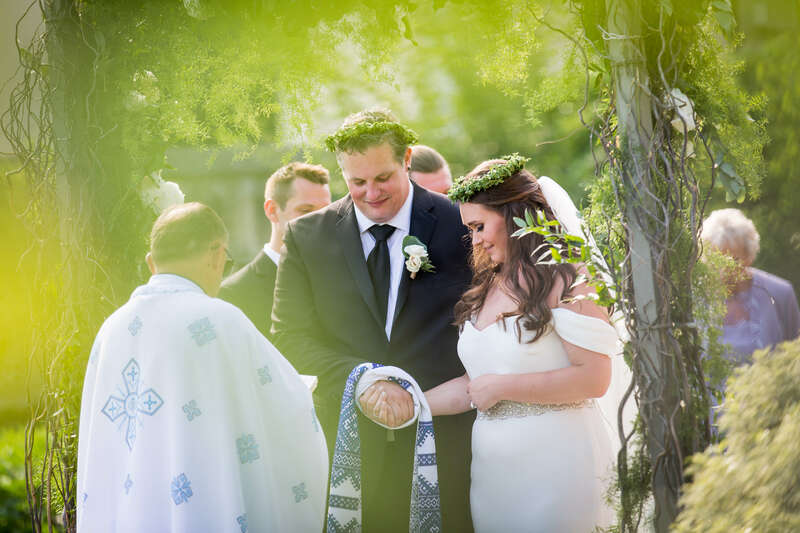 And then there was him, Brandon, so in love with her that he was able to move even us who weds more than forty every year! 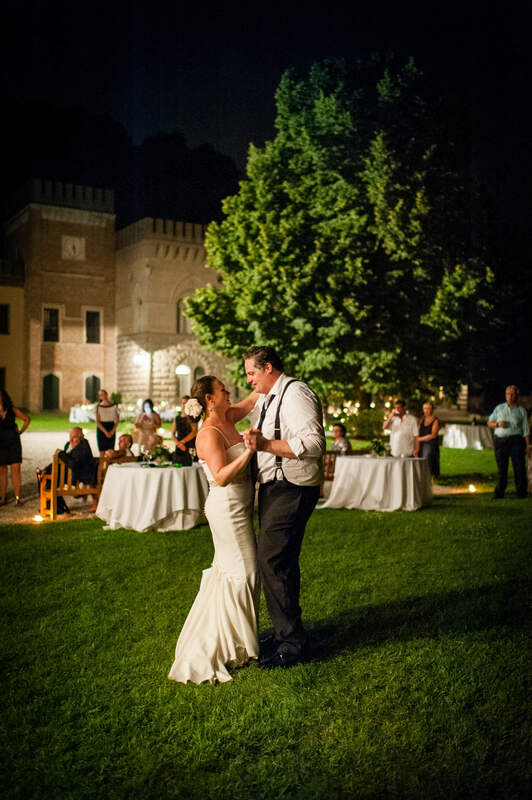 Their guests have been able to stay inside the Castle and enjoy a few days of vacation that were the right occasion to visit Venice and Padua, which always leave everyone expoiled for their beauty. 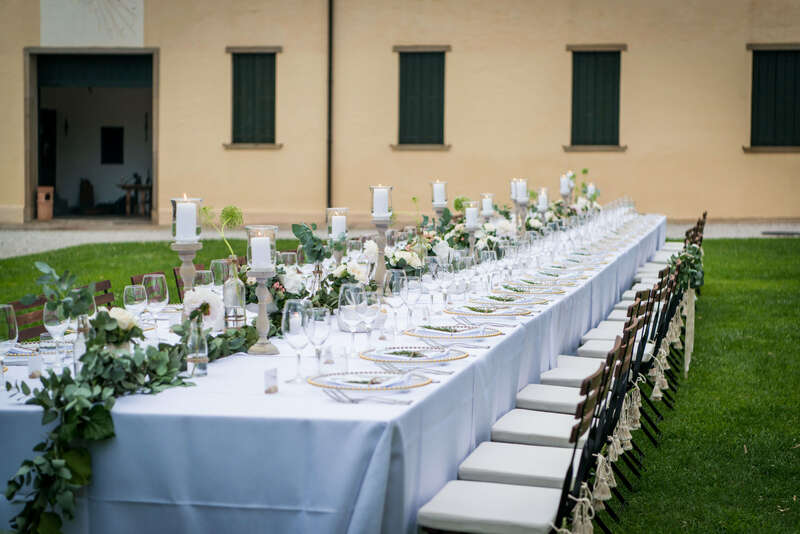 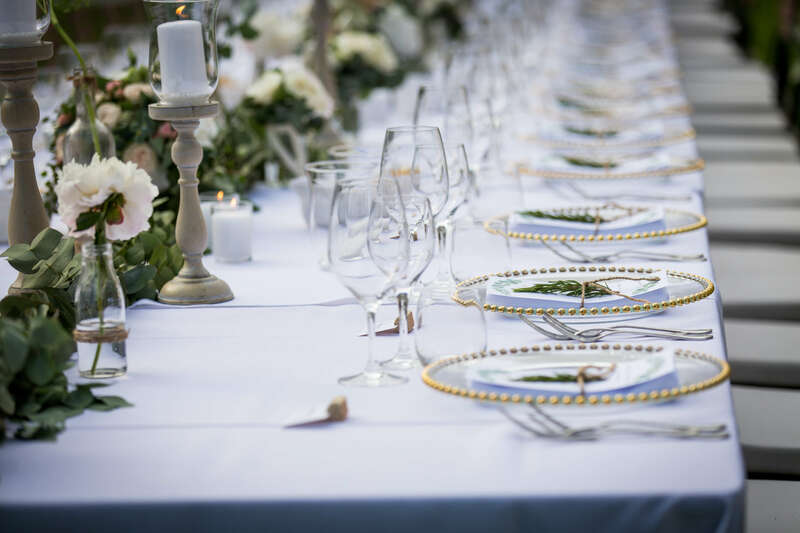 The convivial table was simple but very elegant at the same time and the food, very Italian, was really appreciated, especially by the groom who is a chef by profession and so we can say that satisfaction was double! 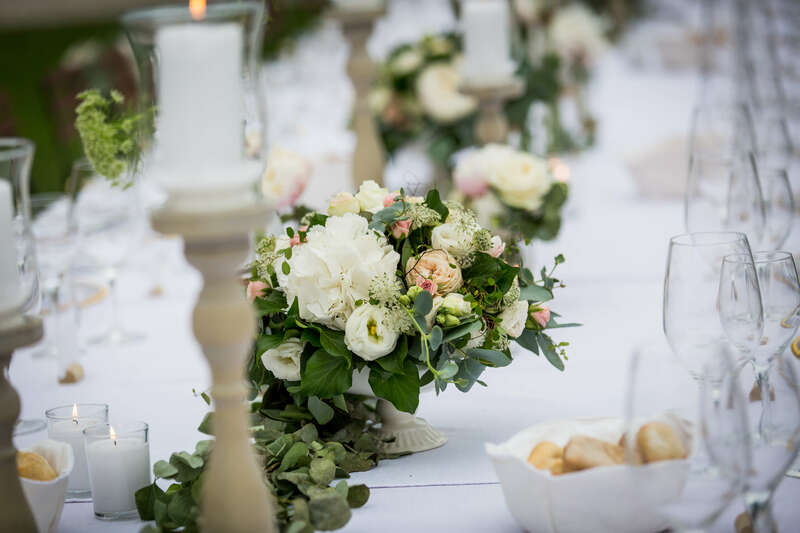 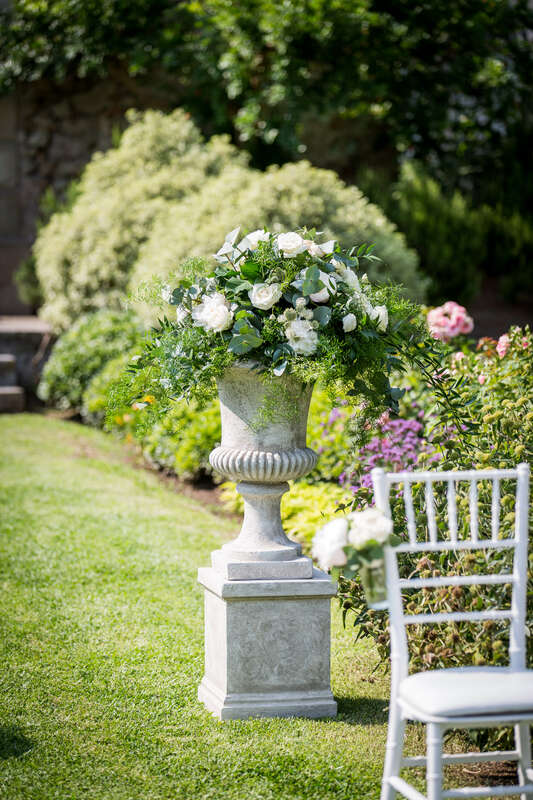 Using seasonal flowers is the best solution for a good result, especially when the heat is felt and more delicate flowers may be affected too much. 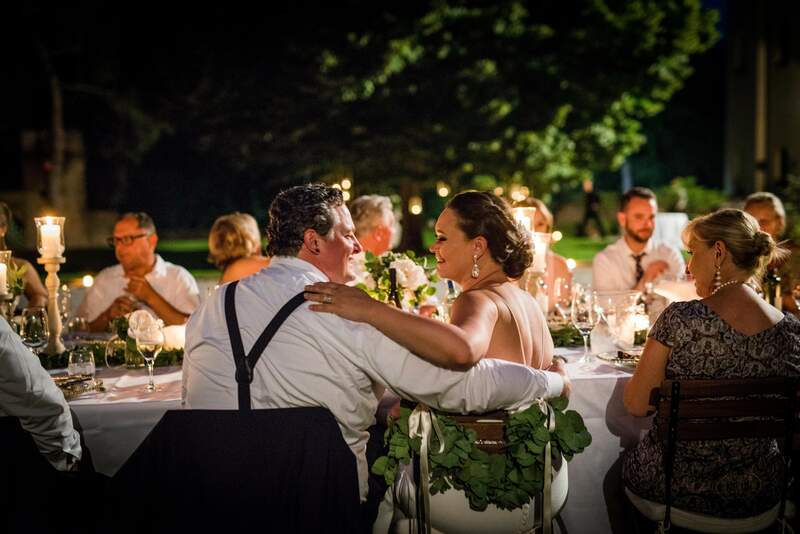 And then the candles, the dances, the hugs and the generosity of all their guests, absolutely one of our favorite weddings last season! 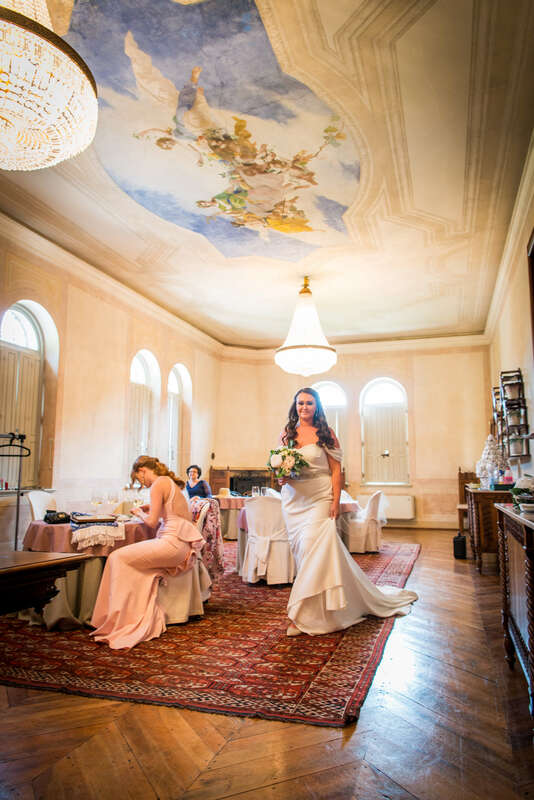 A destination wedding in Italy is an unforgettable event, not only for the newlyweds who will take in the heart this special day but for all their guests who will have the opportunity to celebrate in a magical venue, different from the usual, enjoy a holiday and visit some of the most beutiful places that Veneto can offer, as the city of Venice. 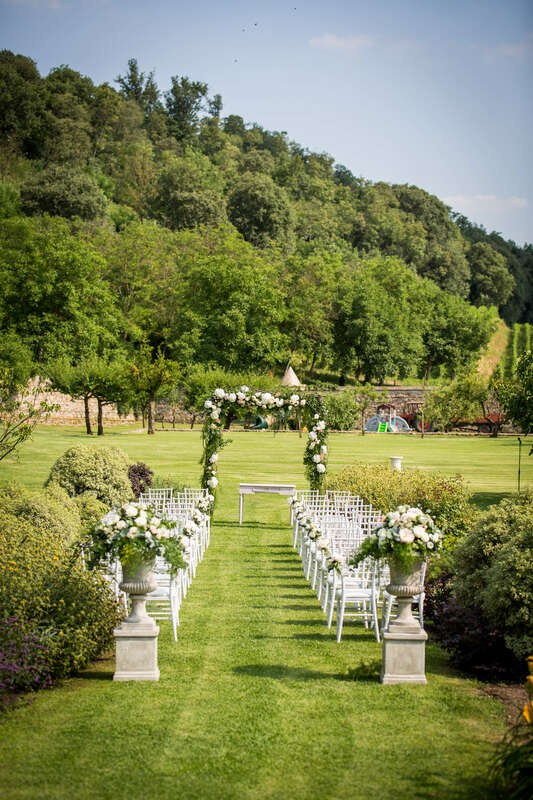 If your dream is to get married in a setting like this, to offer your guests an unique experience, we will be happy to help you organize and be at your side for planning, write us!